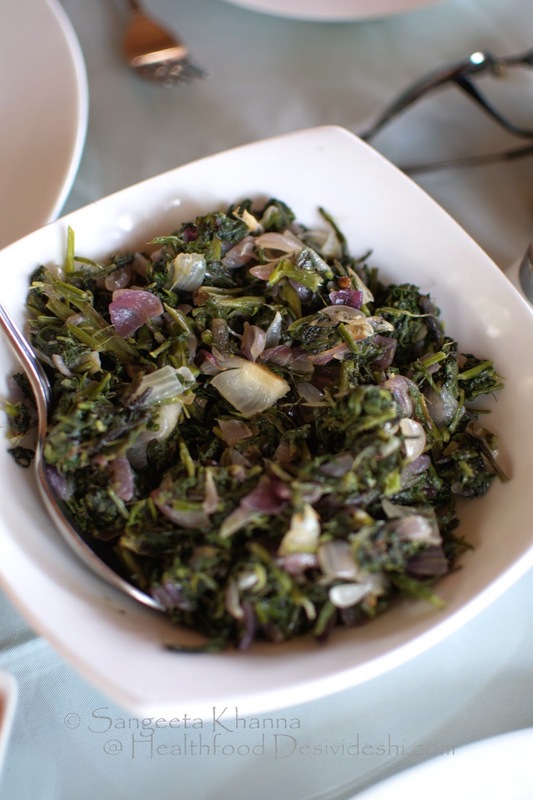 I have been loving this kumaoni palak subzi they serve at Te Aroha. I ask for this spinach stir fry almost everyday for one of my meals whenever I visit here. There is something the way onions are added to this dry stir fry and the way whole coriander seeds make a crunch in the mouth. This would be the simplest spinach stir fry with very clean flavours that can be a part of any cuisine if you ask me. I wont mind a cheese sandwich stuffed with this spinach stir fry if I am having a sandwich, though I don't remember when I had my last sandwich. Heat the oil in a pan and tip in the whole red chillies and coriander seeds and let them crackle. Add the onions and stir fry for a minute or till the onions get translucent. Add salt and spinach and stir fry on high heat for about 5 minutes or till the spinach looks dry. Serve hot with meal of your choice. I like this spinach stir fry with daal or rajma and ragi roti or multigrain roti but you can pair it just with anything you like. Kumaoni palak will be repeated very frequently in your kitchen I am sure.